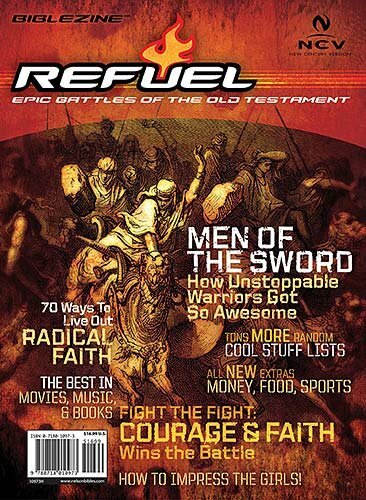 Biblezine (and center of the magazine universe) Update: Since the rexblog was likely the first weblog to publicize the Nashville-published Revolve Magazine, it’s only fitting that I let you know about the April 29 release of its male counterpart, Refuel. The “Bible in a magazine format for teenagers” concept has proven to be a winner for Nashville-based Thomas Nelson with Revolve already selling over 200,000 copies (despite this weblog’s initial cynicism skepticism). While the girl’s version features a fashion-magazine motif, the guy’s biblezine has a guitar as the dominant cover image and appears to be packaged with all the sports-music-skateboard-dude stuff you’d expect in a magazine aimed at teenage boys. Well, with one notable exception.